Before I go on let me just tell you wherever you find your home, you will be with amazing woman who you will forever hold a special place in your heart. That being said let me tell you about my home, my women, my sisters, and the women I have the tremendous honor of leading, the women of Epsilon Theta. If you want to know where the true beauty of our chapter lays you don’t have to look much further than our backgrounds. 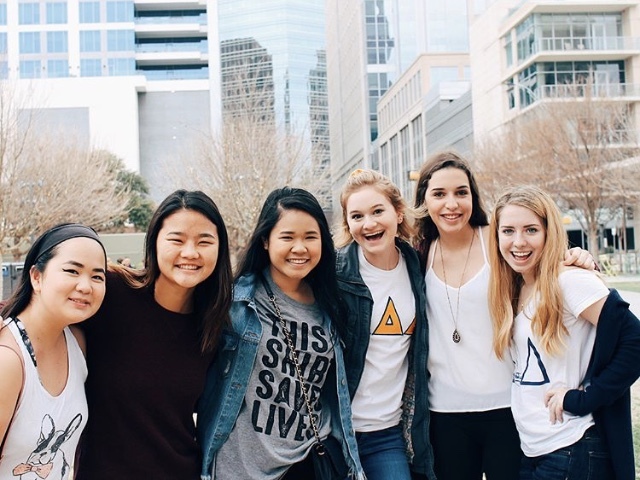 We’re by far one of the most diverse chapters in the country with our women representing over 10 countries, an assortment of languages, an array of religions, and a whole lot of differing opinions, but the beauty in this is that our SISTERHOOD stomps all of our differences. This sisterhood that you get a glimpse of through this website is one that goes beyond chapters on Sundays and happy looking pictures. This sisterhood is about real women who want to encourage and push each other to be better women than they came in. This sisterhood is about coming in as an 18-year-old freshman and leaving as a 21-year-old woman who is ready to take on anything she sets her eyes on. As you you’re going through recruitment I want you to remember that this chapter is one that welcomes you with open arms, this is a chapter that’ll guide you, and nurture you until you go on in the world to create a life that embodies exactly what our founders imagined when this amazing sorority was created. I hope going through this website gives you a glimpse of us, the women of Epsilon Theta, the love that we share, and dreams we’re helping each other make a reality.